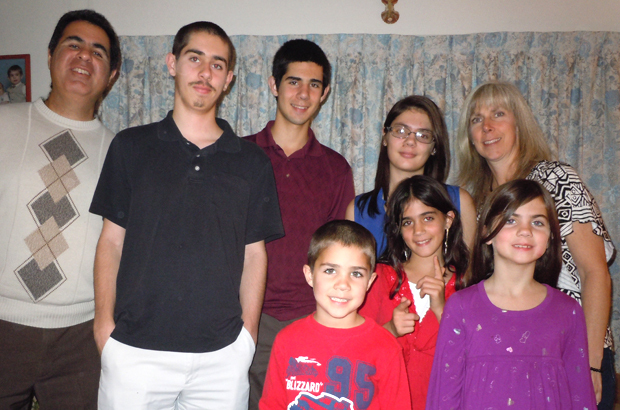 The Speranza family at their home in Warminster, Bucks County includes (top, from left) Victoria, 15; Mike and Christa; (bottom, from left) Nicholas, 18; Gianna, 10; Daniel, 6: Angela, 8 and Benjamin, 17. Mike Speranza’s day job is as an applications engineer. Christa Speranza is a stay-at-home mom. 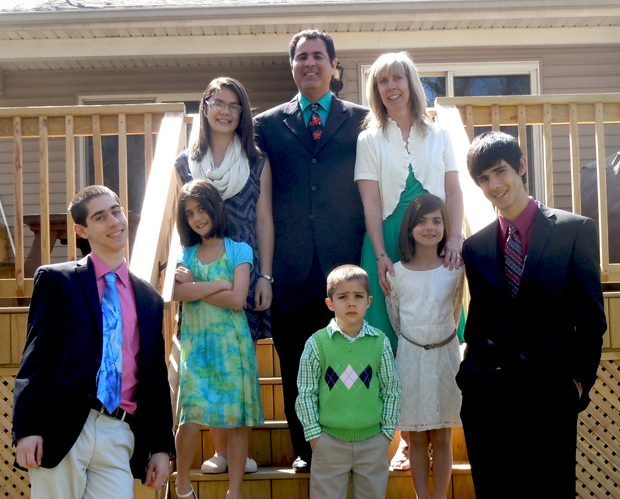 The real 24/7 job for both Mike and Christa is Christian parenting of their six children – Nicholas, 18; Benjamin, 17; Victoria, 15; Gianna, 10; Angela, 8 and Daniel, 6, along with serving on various committees at their parish, St. Robert Bellarmine in Warrington. Nicholas attends De Sales University; Benjamin and Victoria are at Archbishop Wood High, their parents’ alma mater, and the younger kids attend St. Joseph-St. Robert School. Mass on Sundays and holy days are a must in the family, as is grace before meals at dinner most nights and family evening prayers. Mike and Christa are cradle Catholics but as young adults their faith was really just force of habit, essentially on auto-pilot. Mike and Christa were married at Nativity of Our Lord Church in Warminster 22 years ago. Even then, although they went to church most Sundays, if they were out late on Saturday they skipped Mass sometimes because it just wasn’t their top priority. This started to change when Christa became pregnant with Nicholas. One of the first things they jointly decided, Mike said, was that Christa would stay home with their children and they would plan their lives around a single paycheck. “We planned accordingly and bought a house based on income. We did not want the children to have to go to daycare,” he said. “We just believed that a lot of the problems in the world today have to do with the breakup of the family. Things would be much better if families stayed together, talked to their kids, taught them right from wrong, be there to love them. The question is, given the secular climate of today, will Mike and Christa be able to pass their values on to their children? They hope so. Their three eldest were altar servers and active in CYO. Gianna (whose birth year coincided with the canonization year of St. Gianna Molla) is training to be an altar server too, although her ultimate goal is to be a rock star. That’s OK with her parents, provided the lyrics are clean. “We don’t force them to do things, but if they didn’t want to do them they would show resistance. They seem to think these things are fine,” Mike said. “It’s not enough,” he said, “to feed them, to clothe them, to put a roof over their head and educate them. You have to show by example a husband and wife who love one another and know this is the way it is supposed to be. Great article about the joy and benefits of a traditional Catholic family and a lifestyle that is out of favor in today’s anti religious secular culture. Kudos to the Speranza family and also to Catholic Philly.com for highlighting their story. The traditional Catholic family is the foundation of a strong and vibrant Church and we are finally starting to see some visible glimmers of acknowledgement from the Pope and from strong Church leaders and advocates such as Archbishop Chaput. The upcoming World Meeting of the Families is a great event, but it only occurs every few years and is usually located in far off places, so more is needed. It is now time for the Catholic Church to move to the next level of engagement in defending and growing the traditional Catholic Family. From glimmer to fire, from defense to offense, from status quo to forward and upward. Like pro family sermons from the pulpits that celebrate the joys of children; organized write in campaigns against anti family laws, politicians and judges; public reprimands of high profile openly defiant anti-family Catholics, especially politicians; and peaceful protest marches and pro-family demonstrations, lead by Bishops! The future of the Church depends upon this but is the Church up to the task? Has the Church become so cozy and comfortable with secular society that it has lost its will to stand alone and fight? Like the Catholic Church of old? Or will today’s Church continue to go through the motions and whine and complain, but in the end do nothing of real substance? That is the question. What a wonderful article about a wonderful family! They truly serve as living witnesses of family life each day! What a wonderful story about a wonderful family. I would see them every week with their children sitting in the front of church so the children could see what was going on. They are a fabulous example of faith and commitment.